Background: Continually in view of the fact that digital technology entered in the Operating Theatre (OT), surgery has moved out through one of the big revolutions in medical field. 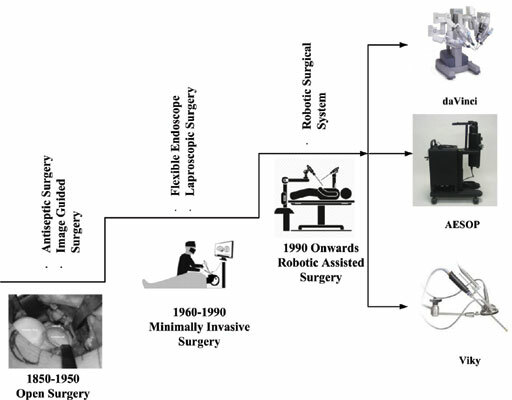 Robotic-Assisted Surgery (RAS) is a way of technological development in the medical environment, designed to thrash the limitations of Minimal Invasive Surgery (MIS). Surgical robots carry out operation with the motion control of manipulator joints on the patient. Precise and fine control of these robots is very imperative. Methods: The paper depicts the control methodology for surgical robots based on the combination of Sliding Mode Control (SMC) with Fuzzy Logic Control (FLC). The destructive chattering phenomenon in SMC is circumvented by espousing FLC in SMC. System stability is investigated using Lyapunov theorem. All numerical simulations have been carried out using MATLAB tool for 2 DOF robot manipulator formulated for trajectory tracking process which shows the efficacy of the proposed methodology. Results: The simulation results of FSMC are compared with the conventional SMC which represents the improvement of control law for the attainment of optimized results. Conclusion: The proposed methodology in the paper is very much suitable in controlling surgical robot during typical surgical operations. The effectiveness of proposed control methodology is shown using simulation studies in the paper. Fuzzy logic control, intelligent control, medical robotics, robot control, sliding mode control, surgical robot.